The DJIA closed today at 12,194.13 for a loss on the week of 70 bps. 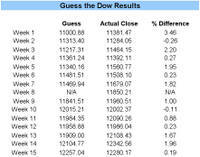 Because of the shortened Thanksgiving holiday week, we did not do Guess the Dow last week -- hence, no winners. Where will the Dow close next Friday? Place your guess in the comments section below before the open this Monday and win two free months of our Newsletter service if you come within +/-5 points. If no one gets within that range, the closest guess wins one free month. But this isn't about the free Newsletter subscription. What we are really trying to find out is if the crowd as a whole is able to come up with a solid prediction. We're putting the wisdom of crowds theory to the test. So take a second and help us out. Have a great weekend! dow finishes december 8th at 11960. Can We still guess the dow? I'm looking for a low.